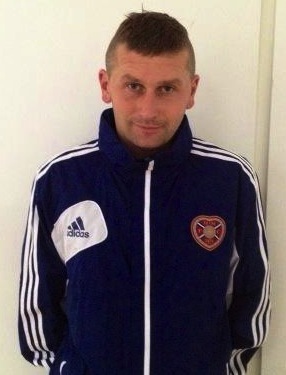 Keith Brown is a Ex Professional footballer now turned Coach. He played for Blackburn Rovers, Barnsley, Oxford Utd, Falkirk, and Berwick. He has his UEFA ‘A’ License. Marc Garnett has experience of working with Academies across England (Liverpool, Blackburn and Manchester City) and is currently working for David Campbell Soccer. 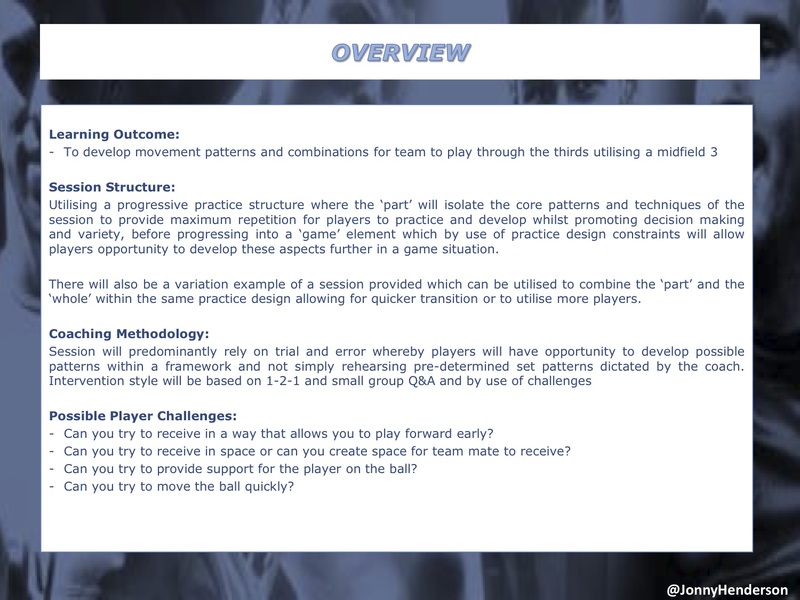 He is a UEFA ‘B’ coach pursuing his UEFA ‘A’ License. 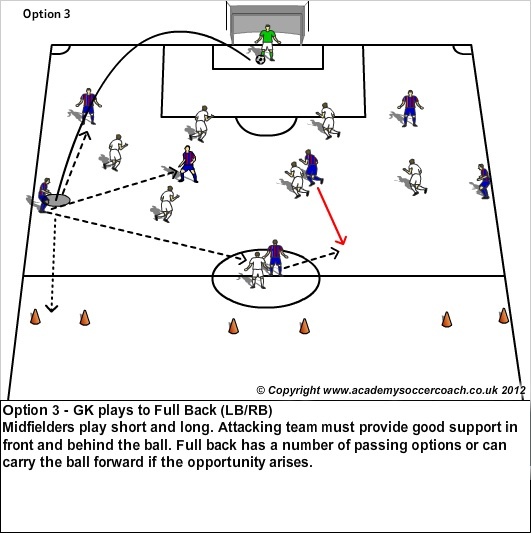 Formation- Team working with (GK-4-2-1) and going to Gates. 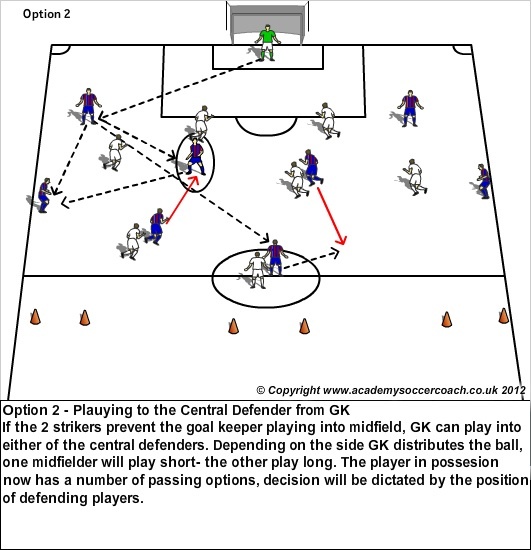 Opposing team (1-4-2) going to goal. 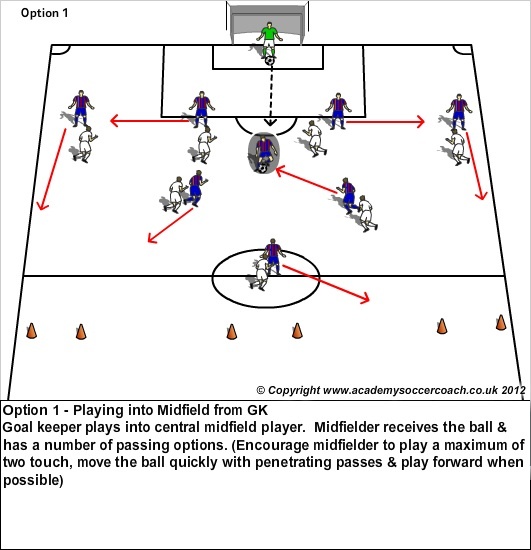 Structured start- Attacking team striker looks to play a through ball into the path of the second striker. Dan is the coach at the Fulham FC Academy U14. He holds a UEFA ‘A’ License. 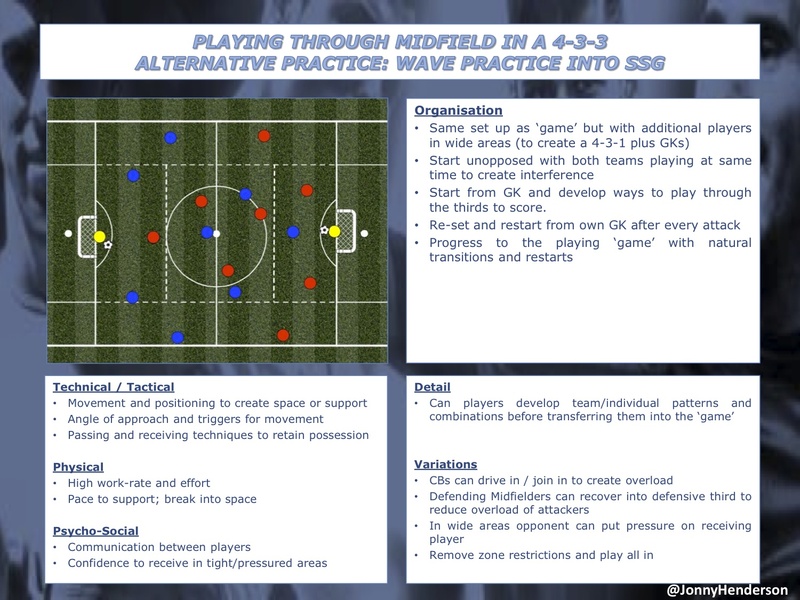 The session is designed on a ‘whole-part-whole’ type method with a game to start, before breaking it down to specifics in a technical passing practice which progresses into a skill practice before returning to the game. 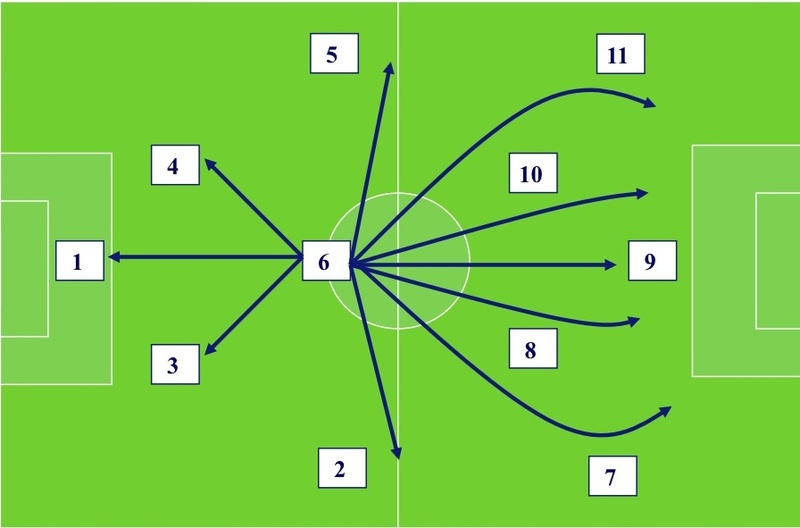 Here is a diagram of the 4-3-3 (4-1-2-3) and its passing options. There are many teams that use this formation across the world. FC Barcelona, Real Madrid, Arsenal just to name a few. Each team has a Defensive Midfielder which is vital for the team to function. In this case the Defensive Midfielder is the number 6. The Role of the Defensive midfielder in a 4-3-3 (4-1-2-3) is vital. They are the catalyst of of the speed of the play either slow (retaining possession) or fast (to penetrate). 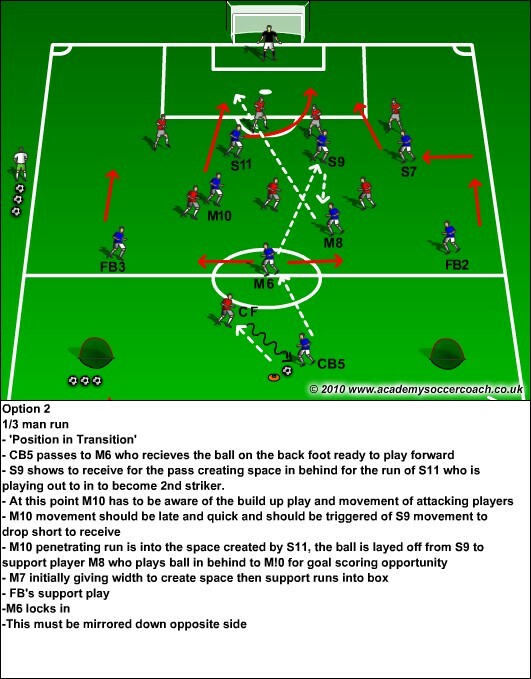 Their awareness of pressure and to play out of tight spaces is vital to keep the ball to manipulate the play. Their range of passing needs to be excellent and their distance and angles of support are important. They need to have the ability to run with the ball to penetrate the play. They are the link between the back four and the 2 central (attacking) midfielders in front of them. 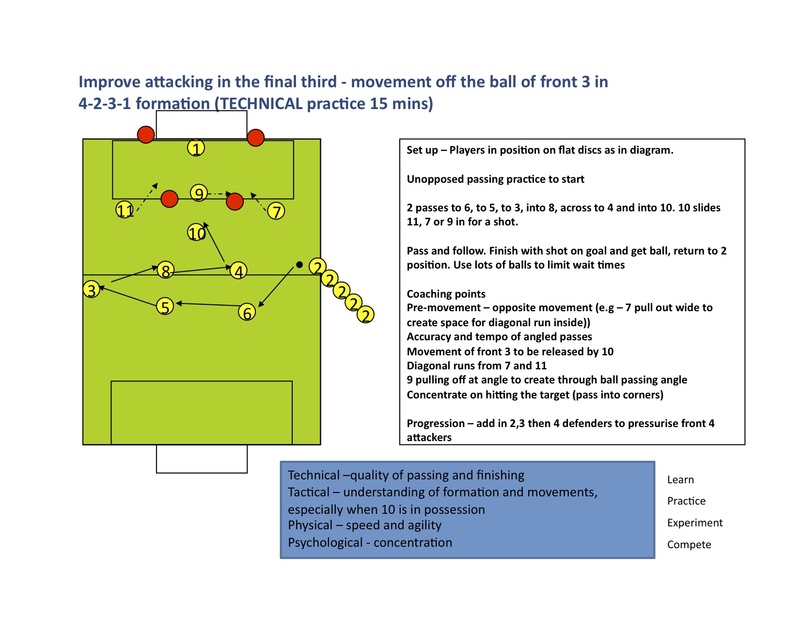 To play the role effectively they need to technically efficient. Defensively the need to be able to read the game to break the opponent down. Forcing opposing players towards pressure are out of play is vital. There energy levels need to be managed effectively to produce this kind of pressure on opponents all game. The have to maintain their positioning and sacrifice themselves for the team. They need to be a leader and communicate throughout. 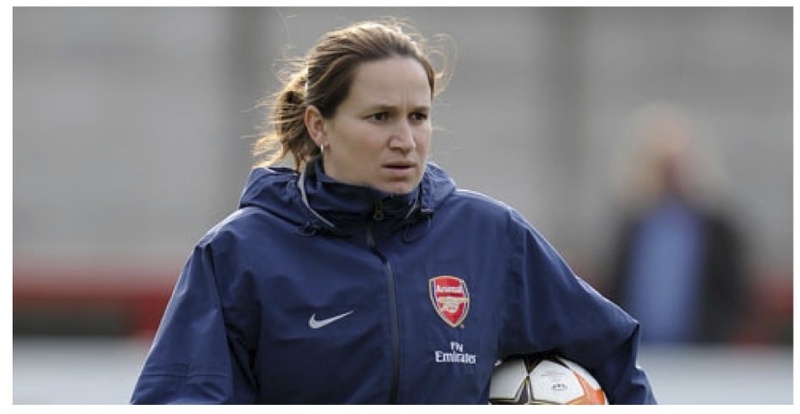 2/ Strong – Individual battles and To hold players off the ball to protect. Sergio Busquets is regarded as one of the spanish greats. His vision, technical ability, awareness is phenomenal however what Sergio does not have Alex Song Does. Alex Song is in my opinion has been very underrated for what he has done in the 3 years at Arsenal. His awareness, vision, technical ability is up their with the best. To compare Busquets to Song technically Busquets would win however Song is not that far behind. 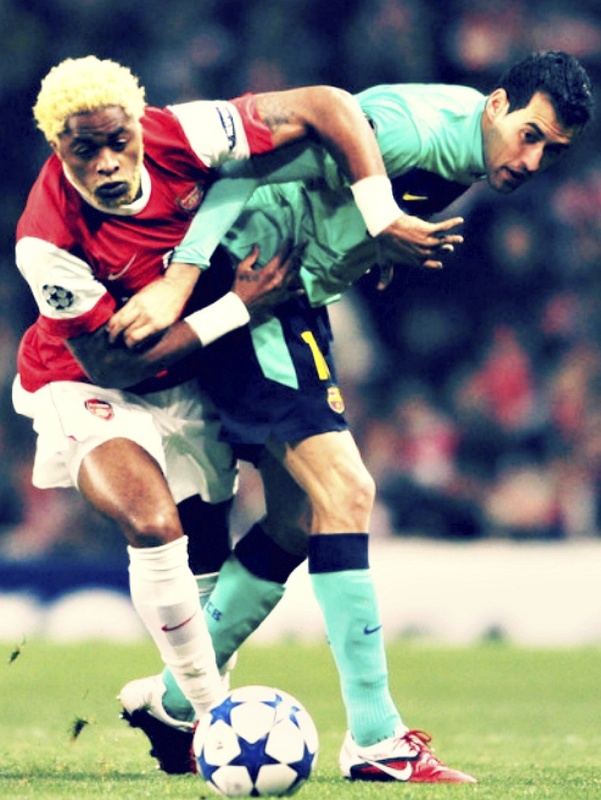 What makes Alex Song stand out is his ability physically to dominate opponents. He is quick, agile, strong in the tackle, and can read the game. Busquets reads the game very well however he is not quick. Barcelona have lately struggled with pace at the back and in the Defensive Central Midfield Role against Madrid. Song could be that player. 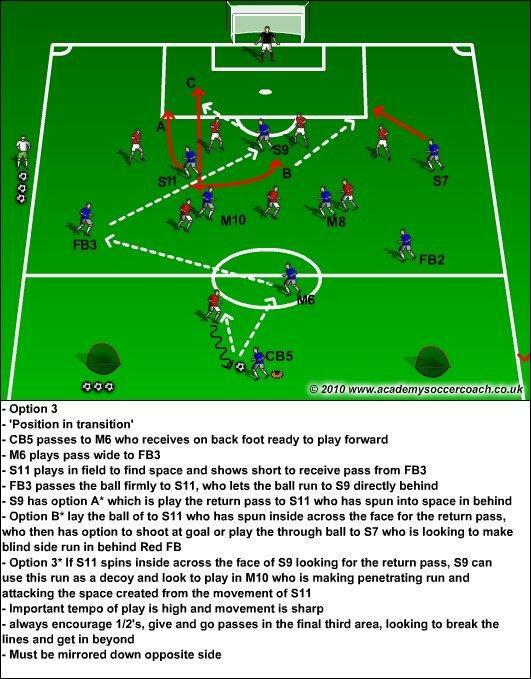 Song is good enough technically to be able to posses and penetrate the Barcelona style of play. Barcelona already have Xavi and Iniesta or fabregas to orchestrate the play and maybe they need that bit of physical dominance and speed to support the team defensively? You cannot take away the brilliance of Busquets and his footballing mind though. He has been one of the main reasons behind Barcelona’s success. Maybe Song will be his cover when Busquets is injured but i believe Song has all the attributes to fill the position and maybe give Barca another option. Both players are versatile (and can play Central Defender) and can fit into Barcelona’s 4-3-3 style of play very easily. Alex song was a great purchase by Barcelona as i feel they need a little more pace when defending against teams like Madrid on the counter attack. Here is a great slide show on the future of Football/Soccer and where it has come in the world game. This was produced after the 2008 Euros to analyze the english game and where it has to go to become a world force again. It shows clearly that the game needs to adapt to the modern game. The 2012 Euros was a perfect example of how far behind we still are in the game tactically and technically. 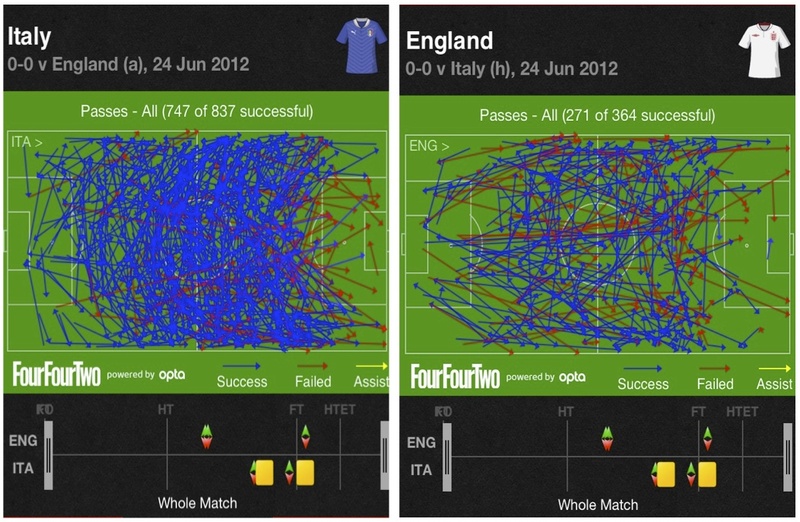 In the quarter final versus Italy, England were completely out played. England played flat 4-4-2 (defensively turned into a 4-4-1-1) and got completely overran in midfield. Andrea Pirlo was the complete play maker for italy, accept for the final versus Spain. Spain got their tactics right as Xavi was tight to Pirlo when Italy had the ball, which didn’t allow him time to dictate. For England this was not the case due to the lack of tactical know how and old fashion 4-4-2 style. 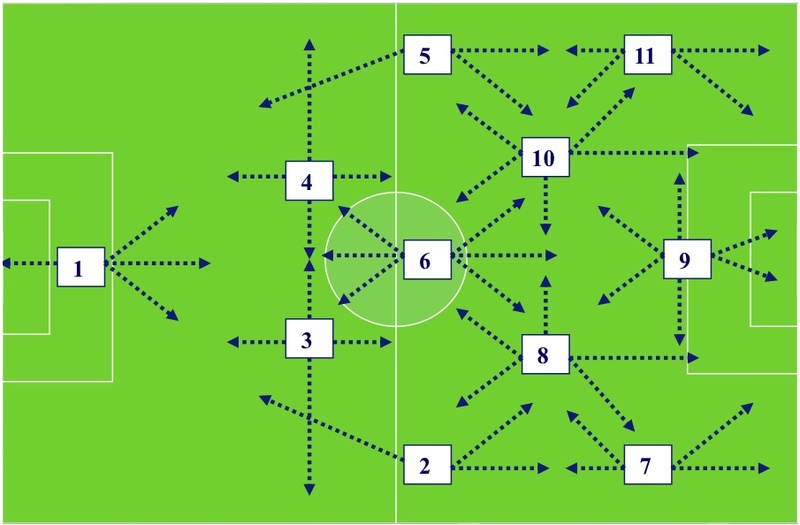 Italy played the modern 4-4-2 diamond and had joy versus Germany’s strict 4-3-3. Their tactics were excellent. They forced them inside to their numbers in midfield to allow Pirlo again to dictate. However in the Final Spain (playing 4-3-3) Dictated the game due to the high pressing game. Here is a video of Roy Hodgson before Euro 2012 talking about the pros and cons of 4-4-2 and and his not so positive opinion on the 4-3-3. • For a zonal back 4 defence, one mobile central striker can be more of a problem to handle than two. 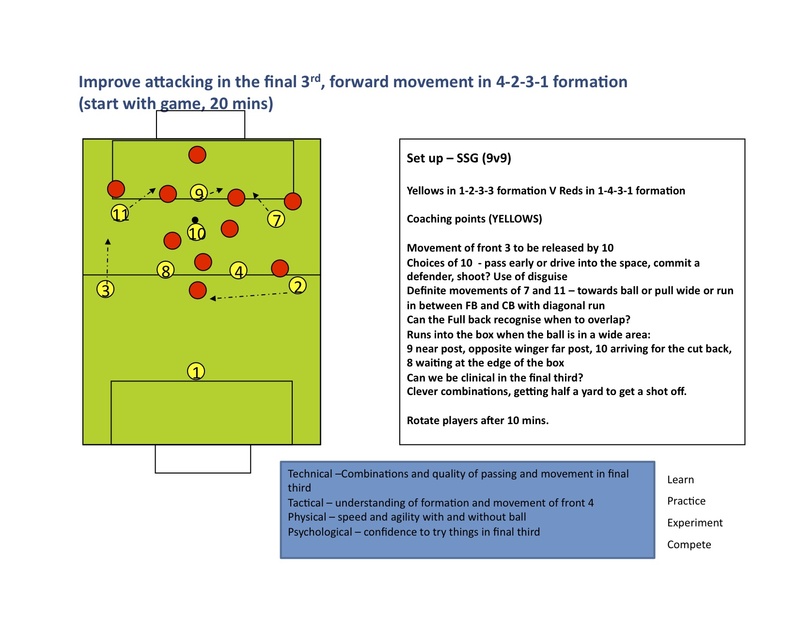 • “Early” and “high” width can be established on gaining possession. 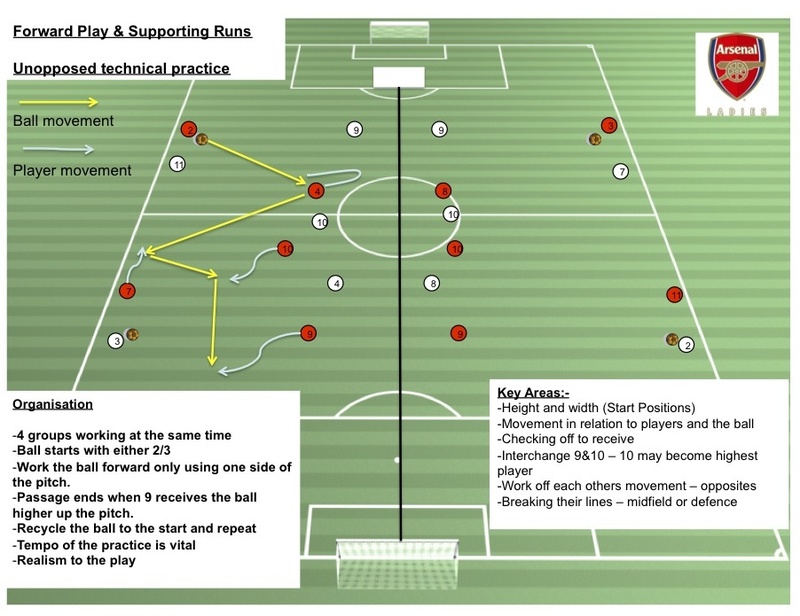 • Movement, inter-change and positioning “between” opponents causes marking difficulties for zonal defences. • If opponents mark on a man for man basis then more “individual” working space is available. • Three MF often outnumber opponents for attacking build ups and defensive responsibilities. 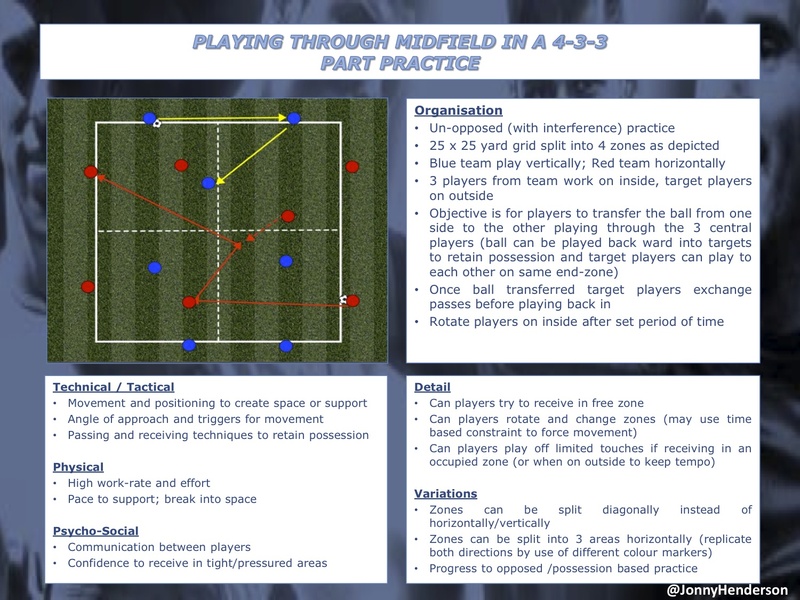 • The shape of the three MF players can be changed / inverted to provide marking problems for opponents. • Three MF players offers defensive numbers and compactness in central MF areas and reduces pass routes to opponents central forwards in the defending half and around the penalty area. • Two of the three MF have the freedom to attack leaving “security” behind. • A zonal back 4 covers the width of the field more economically and quickly, and defenders are generally in closer proximity to each other to provide support if necessary. It is clear to see that 4-3-3 and now 4-4-2 diamond is being used more on the international stage and in club football. For me England and Roy Hodgson adapting in their first friendly back is a step in the right direction.